Brief Summary: While Grant’s Fourth Offensive had started four days earlier, on August 14, 1864, with the Second Deep Bottom Campaign north of the James River aimed against Richmond, that was only half of the story. After Lee had weakened his lines around Petersburg to protect the Confederate capital, Grant sent General Gouverneur K. Warren and a reinforced Fifth Corps west to the Weldon Railroad, several miles south of Petersburg at Globe Tavern. Warren was to gain a foothold on this important Confederate supply line and destroy as much as possible. On August 18, Warren advanced south from the existing Union lines east of Petersburg down the Jerusalem Plank Road and then turned west, marching past Dr. Gurley’s house to hit the Weldon Railroad near Globe Tavern. He reached the railroad around 9 a.m. on August 18, 1864, one hundred and fifty years ago today. While Charles Griffin’s Division began to tear up the Weldon Railroad south of Globe Tavern, Warren sent first Ayres’ Division and then Crawford’s Division, to Ayres’ right, north to guard against any Confederate attempts to break this sortie up. By 2 p.m., Heth’s Division of Hill’s Third Corps, Army of Northern Virginia assaulted Warren’s two division line, managing to sneak into a gap on the Weldon Railroad where Ayres on the left joined Crawford on the right. This Confederate assault drove the Union lines back in the direction of Globe Tavern. Warren mounted a counterattack of his own with portions of all four of his Fifth Corps divisions, backed by the Corps artillery north of Globe Tavern, which managed to regain most of the lost ground. He began to dig in as reinforcements arrived overnight for both sides. The Confederates were desperate to remove Warren from his stranglehold on the Weldon Railroad, and would launch more attacks in an effort to do so. This was only the first of three days of fighting to come. Brief Summary: After Warren gained a lodgment on the Weldon Railroad on August 18, 1864, the Confederates brought on reinforcements the next day to drive him away in the form of three brigades of William Mahone’s Third Corps Division as well as two brigades of Rooney Lee’s Cavalry Division. The Union had also brought up reinforcements from John Parke’s Ninth Corps. Parke had replaced Burnside after the Crater debacle from a few weeks earlier. Globe Tavern on the Weldon Railroad. 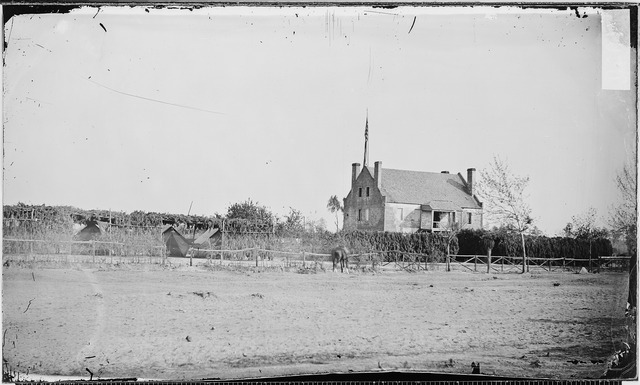 Near Petersburg, Va.
Warren had started digging in around the point where the first fighting had taken place on August 18. Ayres again held the left and Crawford the right. Bragg’s Iron Brigade of Cutler’s Division was attempting to act as an extended skirmish line from Crawford’s right to the left of the existing Union entrenchments at Jerusalem Plank Road. Mahone was placed in command of an ad hoc attack force of three brigades (Weisiger’s Virginians, his own former command from his division, and Colquitt’s and Clingman’s Brigades of Hoke’s Division). As he had done before at Jerusalem Plank Road a few miles east and a few months removed, Mahone used the terrain to overwhelm Bragg’s skirmish line to slip between the right flank of the Fifth Corps and the existing Union Second Corps entrenchments near Jerusalem Plank Road. The resulting flank attack hit the brigades of Crawford’s Division from the right and rear, and 2,500 Union soldiers were captured in the resulting chaos. A frontal assault by Heth’s Division on the Union left and center was repulsed, or the disaster could have been worse. Warren gathered together reinforcements to attempt to restore the situation. White’s and Willcox’s divisions of the Ninth Corps moved north to take Mahone’s flankers in their own left flank and stabilized the line. Part of Griffin’s Fifth Corps division moved north to link the Fifth Corps left with the Ninth Corps attack on the right. Warren still held the Weldon Railroad, but he had lost the equivalent of a small division in captured alone in one day. Heavy rain would prevent fighting on August 20, but the Confederates were not done attacking what they hoped was a temporary interruption of their Weldon Railroad supply line. One more attempt would be made on August 21, 1864, and it was a bloody attempt.